According to Simon, a resident of Jaywick who was kind enough to give me a good tour of the town, one of the most distinctive sounds of Jaywick is the Great Green Bush-cricket, which you can hear all over the place, especially as night descends. The bush-crickets have thrived here, more so than in other urban environments, because most of the grass verges and gardens are left to grow, which enables local flora and fauna to prosper. The bush-crickets have done exceedingly well and make a lot of noise after dark. In this recording I was near the junction of Brooklands Gardens and Lotus Way, in an area colloquially known as Dodge City. 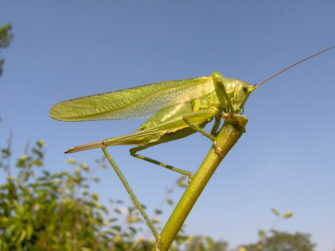 Image of cricket by Daniel Ruprecht used under Creative Commons (Attribution-ShareAlike) licence. I heard crickets at the end of Chalkwell Esplanade a couple of summers ago, I did try to record them, got a lot of the wind in the trees and fainter waves on the beach but no crickets, so those in Clacton might be the loudest in Essex.